Here is the latest stone sculpture from my Wonderful World of Dust, “Sun Horse”. Horses hold enormous significance for me which I can’t verbalize. This sculpture is my charm, talisman, great glowing orb, vessel filled with positive energy and good things to come. In many cultures people dedicate and concentrate their energy through some activity to influence a situation they want to change. These activities go by a variety of different cultural names, but the intent is similar. The process of making this sculpture was my dedicated effort to help ease the grief of my friends who lost very special horses this Spring. One was among the oldest horses in the world, and one among the youngest. Art has a way of turning the pain of grief into a celebration of memories and experiences. It tightens the bond with beings who have passed on. I know it is much easier to make a sculpture than it is to mend a broken heart, but maybe it will help a little bit. I put my energy of creation out there in hopes it will aid their healing. Process is really what any kind of art-making is all about for the artist. In Animation for me it was all about the animating–being the character and refining the performance to present exactly how and what I wanted to communicate. Feeling the emotions through the movement and getting that on the screen was my goal. It is a similar process for me with sculpture. I want to shape the stone exactly the way I see the figure in my mind. That is my challenge and my goal. With stone, however, other variables exist as well. What is going on with the stone itself? What surprises lie concealed within the solid mass I am meticulously shaping? Does it break? Are there colors and layers hidden within? Will it continue to inspire me to complete my idea? Does it make me think of other forms I want to include in the sculpture? If I am lucky, the creative process will inspire another idea for another sculpture. I think these variables make carving stone more exciting and more risky than animation. Planning the sculpture is my rehearsal, my pencil-test in Animation jargon. The carving is the show. With animation it is just the paper, the pencil, and me. (I am the only variable.) With sculpture, the stone is a major player, too. 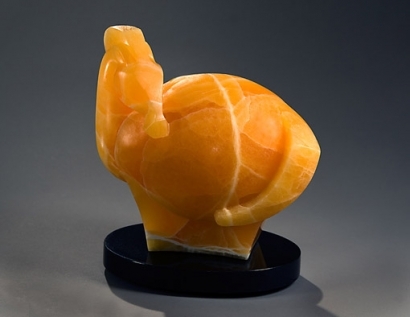 This sculpture began as a boulder of honeycomb calcite coated in a thin white oxidized layer. I could not tell what was inside the stone. In direct sunlight I could see that there was a peachy-yellow glow under the white opaque layer. That was it. Sculpting “Sun Horse” was my first experience with this stone,and it was a bit like meeting someone (who couldn’t speak) for the first time. When I cut into the stone with my blade and began removing slices of rock the color and the transparency were remarkable. The thick veins of white contrasted dramatically with the transparent orange and yellow areas even when the stone was dry. (Colors really pop to life when you wet the stone.) Throughout the entire carving process this stone amazed me by its difference to other kinds of stone. I feel like it gave me and taught me much more than I expected. The design of the piece is composed of large, simple shapes because I thought the stone would be the star in this sculpture, and I think I was right. Detail would be lost in the orange and yellow “plaid” of this stone, and swallowed by the transparency of it. Forms read in 3-D space because of the variations of light and shadow reflected off the surface of the sculpture. In “Sun Horse” light reflects but it also penetrates, so light and shadow behave differently. It was really neat to carve this stone with light penetrating into it. I lost my equilibrium and sense of location just looking. Finishing the stone was another revelation. Honeycomb calcite is very brittle and must be carved only with tools that grind. No percussion is allowed or it will bruise and break. The crystals are long and thin, sort of like the fur on a short-haired cat. Careful grinding was actually quite easy, but the rasping, filing, and sanding was a completely different experience. My carbide rasp turned the translucent orange forms to opaque white again. What! What happened to my gorgeous glowing orb? Then the slow process of filing and sanding gradually removed the hideous white scratches left by the rasp. The crystals were fairly large and very hard, and getting past the crystal-stage (getting to the point where the space between cut crystals was diminished and finally gone) was a challenge. Happily, there was a pay-off at the end with the restoration of brilliant colors that glow. My next adventure with honeycomb calcite will be greatly informed by this first experience and much less nerve-wracking.